We flew home yesterday afternoon via Seattle. As the plane began to descend, I thought we were over the ocean because all I could see was glowing sunshine on white billows. As we continued our descent the billows became clearly distinguished as clouds. Passing through the clouds we landed in grey-sky Seattle, and connected a flight to grey-sky Victoria. Somehow, it cheers me up immensely to think of this grey cover as such a thin veil that cannot keep that brilliant sunshine from us indefinitely. Our days in Mexico were grey, too, but each vacation day in California was warmer and sunnier than the previous one. Our sun-starved bodies and souls soaked in all they could. You can tell by the photos that I was craving colour - bougainvillea, osteospermum, asters, and a flowering decorative pear tree. The planting in the above photo captured my attention. Driftwood logs - we have those. Succulents - we have those. A hollowed out driftwood planter may be in my summer garden plans. Meanwhile, today was church, lunch at our daughter and son-in-law's, followed by grocery shopping and now, laundry. It's always good to come home and I'm glad I had that taste of spring to carry me over until it arrives for real here. Remember, the sun is shining brightly beyond those clouds. Linking with Mosaic Monday hosted by Mary of the Little Red House, and with Sunlit Sunday, hosted by Karen of My Little Home and Garden. 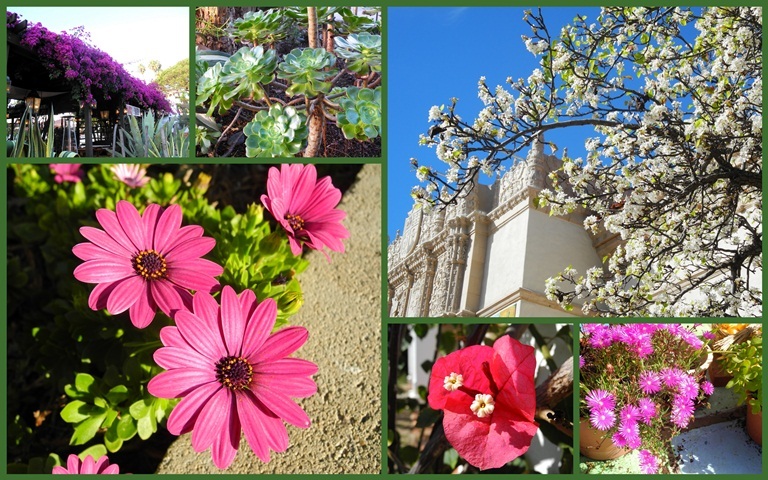 Click on over to both of these sites for some wonderful mosaics and more sunshine! thanks for the reminder! Love your sunny mosaic! So pretty! I've got to pin this driftwood log for my gardening folder. I have a log there with flowers, but not succulents. Welcome home! Hope that you have tomorrow off. I have pots and post of succulents from last summer's potting frenzy. I was just looking at them yesterday - now I know what to do with them. So, you've seen spring, and can attest to the fact that we will have warmth and colour - thank you! Welcome back! I like that idea of planting succulents in driftwood. Planting in a piece of driftwood sounds like a good idea. It's nice to get away to a sunny location and enjoy their colours of flowers. That driftwood planter is a mighty fine idea, Lorrie. I think you may have inspired many with that photo. Lovely images and thoughts! Glad you had a safe trip and are settling in back home. Your little glimpse of spring should keep you going for awhile. What a lovely holiday you had in the sun Lorrie! Such a blaze of colour is a reminder to you all in the Hothern Hempisphere that Spring is not far away and then Summer! So there is Spring somewhere! What cheerful photos. I am sure that the memory of the bright colours of the flowers will warm you till spring arrives. I love the idea of the log planter. You will have to come back and show us yours! Yes, you are right, the sun is shining behind the clouds. Have a wonderful week, and enjoy this weeks Mosaic Monday. Love these super colourful photos! Wonderfully colored mosaic. I love your flowers. You must have a wonderful time in the warmth. It's so nice to see flower in bloom - refreshing. I can see how they might tie you over until Spring! And I love the photos below from the coast of CA. Lovely. Flowers are always a treat to see. Sounds like you had a lovely trip despite some grey days! Happy Monday! I love the driftwood log for a planter - that would be perfect for our deck. Terrific flowers from California - I miss the early spring down there, but I'll enjoy ours once it gets here. This post makes me think of "Sunshine and Lollipops!" Thanks, Lorrie. Lorrie, I love how you expressed your idea of their being sun beyond the clouds. Arizona had quite a bit of rain my first week or so here, but the sun returned and the dessert is getting ready for the spring blooms to come. Thank you for bringing your sunny, colourful photos to Sunlit Sunday. We were in grey Seattle yesterday as well...taking in a concert. Glad you found sunshine in CA...and looking forward to hearing more. It sounds like you had a nice relaxing vacation, Lorrie! I'm glad you had some sunny days amongst the grey ones. Your photos are so wonderfully colorful! looks like spring. Love that. Whish it was here.